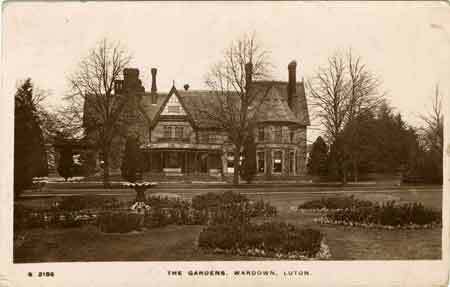 Monday 15th November 1915: It is encouraging to hear of the sterling work being carried out by the volunteer nurses of the Luton Voluntary Aid Detachments at Wardown House Hospital. Early in the war the mansion was placed at the disposal of the military authorities. Gifts of furnishings and equipment were sent from all over Luton and in October 1914 it was opened as a clearing hospital. As such it was used to nurse any cases of sickness among the troops training in the Luton area, and was also used as a training school for men of the Royal Army Medical Corps. At its busiest as many as 90 patients at a time were in residence, in the wards, in the annexe, or even accommodated in tents outside the house. Nurses provided by the V.A.D. have provided vital services from the time the hospital opened. New arrangements are now being made for Wardown. Last week the hospital was transferred from the military authorities to the control of the V.A.D. Committee. At the present time there are only a few patients, but preparations are being made to receive about 70 wounded men who will be transferred from Aylesbury Hospital. These will be nursed entirely by the women of Red Cross V.A.D.s 12 and 14, under the command of Mrs. J. W. Green and Mrs. R. Durler. The Voluntary Aid Detachments were founded in 1905 at a meeting presided over by Queen Alexandra, and function under the auspices of the British Red Cross. By 31st March 1915 there were 2,207 V.A.D.s in Britain, with 66,059 members. The Red Cross ladies of Luton include two quartermasters, 44 nurses and seven cooks. These volunteers are all now leading a life very different to the one they enjoyed before the war. Three of the nurses are on “active service” in France, and the remainder have been notified that they will now be called upon for both day and night nursing duties. They will be under the direction of a matron-in-charge and assisted by two professional nurses from London.